The long-serving second-in-command of al-Qaeda, Ayman al-Zawahiri, has been appointed its head following the death of Osama Bin Laden, the militant organisation said in a statement. Bin Laden was killed by US forces in Pakistan in early May. Al-Qaeda warned it would continue to fight a holy war against the US and Israel under Zawahiri's direction. A US official dismissed Zawahiri's appointment, saying he had "nowhere near" Bin Laden's credentials. The statement announcing his appointment was posted on a militant website and attributed to al-Qaeda's General Command. "Sheikh Dr Ayman al-Zawahiri, may God guide him, assumed responsibility as the group's amir [leader]", it said. It vowed that under Zawahiri, it would pursue jihad or holy war against the US and Israel "until all invading armies leave the land of Islam". Analysts say Egyptian-born Zawahiri, 59, is intelligent but lacks the charisma of his predecessor. He is claimed by some experts to have been the "operational brains" behind the 9/11 attacks on the US. For years Bin Laden's deputy, with a $25m (£15m) bounty on his head, he had been widely anticipated to replace Bin Laden at the helm. Dr Ayman al-Zawahiri was always going to be the default choice to succeed Osama Bin Laden. A highly intelligent Egyptian extremist, he was the man who got Bin Laden to "think global" in the 1990s, broadening his message from just complaining about US troops on Saudi soil to a whole range of Muslim grievances from Kashmir to Palestine. But experts say al-Zawahiri lacks the personal charisma of his predecessor. There are also doubts as to whether, as an Egyptian, he will command full authority over al-Qaeda's operatives from Saudi Arabia and other Gulf states. Zawahiri, whose 60th birthday is believed to be this Sunday, warned just over a week ago that Bin Laden would continue to "terrify" the US from beyond the grave. 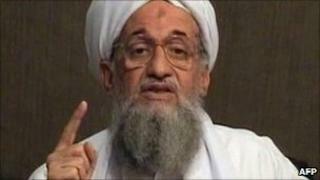 In a video message posted on the internet on 8 June, Zawahiri said al-Qaeda would continue to fight. "The sheikh has departed, may God have mercy on him, to his God as a martyr and we must continue on his path of jihad to expel the invaders from the land of Muslims and to purify it from injustice," Zawahiri said. "Today, and thanks be to God, America is not facing an individual or a group, but a rebelling nation, which has awoken from its sleep in a jihadist renaissance." But Zawahiri's appointment was given a scornful response by an unnamed senior US official, who said he had not "demonstrated strong leadership or organisational skills" in the past. "His ascension to the top leadership spot will likely generate criticism if not alienation and dissention with al-Qaeda," the official said. He said Zawahiri would find it difficult to lead while focusing on his own survival. "The bottom line is that Zawahri has nowhere near the credentials that [Osama Bin Laden] had," said the Obama administration official. The BBC's Middle East correspondent, Jon Leyne, says priorities for al-Qaeda's new leader may include attempting to to mount a big attack to show the organisation is still in business. In addition, he says, Zawahiri will want to turn the wave of unrest in the Middle East to al-Qaeda's advantage - perhaps building more of a power base in Yemen and working to intensify the instability there. In his message last week, Zawahiri applauded the Arab uprisings against "corrupt and tyrant leaders" and urged those involved to continue their "struggle until the fall of all corrupt regimes that the West has forced onto our countries". But our correspondent adds that the delay in announcing Zawahiri as al-Qaeda chief - coming as it does more than six weeks after Bin Laden's death, despite his being the obvious choice - may point to divisions within the leadership. Zawahiri has for years had a bounty on his head and security analysts have suggested he is most likely to be hiding in the Afghan-Pakistan border region. However, Bin Laden and other key militant leaders who were also believed to be concealed there have instead been discovered in Pakistani towns and cities. Bin Laden's killing by US special forces in a covert operation in the garrison town of Abbottabad on 2 May strained Washington's relations with Islamabad. US President Barack Obama said "someone" was protecting Bin Laden, but Pakistan has denied any knowledge of Bin Laden's whereabouts and has arrested alleged CIA informants.